Defeat drouth for the Pleasanton Eagles ended here Friday night as the green-and-white squeezed out a well-earned 7-to-6 victory over the Three Rivers Bulldogs in Eagle stadium. Get that score, neighbors, Pleasanton 7, Three Rivers 6. That’s right…Pleasanton 7, Three Rivers 6. No mistake…Pleasanton 7, Three Rivers 6. It was the first PHS victory of the season and the first over Three Rivers in seven years. The Eagles did it the hard way, too, grinding out short yardage on the ground. Pleasanton countered midway in the second period when Frank Tudyk Jr. dived over from two yards out and Gene Qualls added the all-important extra point. Three Rivers retaliated with a 13-yard t.d. gallop by QB Leland Bell early in the third period. The kik was blocked. And that was the scoring. With the first period a third gone, PHS marched 61 yards to the Bulldog 15 before losing possession. The Eagles learned a valuable lesson in the blunted thrust; their wide stuff wouldn’t go but the PHS backs-Tommy Ellison, James Harrison, Tudyk and Butch Tausch-could go inside the tackles. 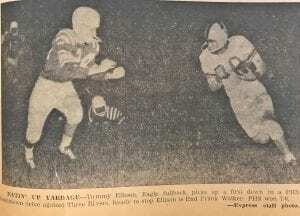 Halfback Bobby House gave the Bulldog partisans something to cheer about when he swept the Eagle right wing for 34 yards before Tausch rolled him out of bounds. A 15-yard holding penalty and a short kick into a whistling south wind gave the Eagles a first down on their own 44. In nine plays the homelings smashed to the 2 with Ellison crashing inside the tackles and Tausch once squirming loose for 9. Tudyk got the Eagles on the scoreboard by diving over from the 2. Qualls kicked what was to be the game-winning extra point and the Eagles led 7-0. Aided by a personal foul penalty the Bulldogs pushed to the PHS 30. Aided by a personal foul penalty the Bulldogs pushed to the PHS 30. An aerial from Bell to Wayland Adian-only pass completed by Three Rivers-was nullified by a holding penalty and the Eagles regained control. A Bubba Wehman punt was blocked by T-RHS as the half ended. It appeared that the green-and-white might have lost their spark in the third quarter. A short kick gave the Bulldogs the ball on the PHS 38. Noe Garza picked up 4. House streaked to the 13 on a re verse and Bell, on a quarterback roll out, hit pay dirt standing up. But Rodney (Red) Hayden, Eagle center, came storming through to block Bell’s placement kick. The Eagles twice fired up drives after that but failed to go the distance despite some fine running by T.H. Holland, freshman back, who got his chance when Harrison was injured and Tudyk moved over to the man-under slot. Holland churned off short-yardage time after time, intercepted one pass and was a key man on the final play of the game that had the spectators standing. PHS blasted down to the Three Rivers 16 on what appeared to be the last play of the contest. It was a yard shy of a first down. Part of the players had gotten off the field when the officials ruled there was time for one more play. Bell threw long-and Holland batted it down. He was one of a half-dozen or so Eagle heroes…Tudyk who scored…Qualls who kicked the extra point…Hayden who blocked the Three Rivers try…Mark Midget who has joined the squad, and played tough defensive ball…Ellison who turned in his best offensive performance and went the route despite a cut mouth…Harrison who ran and threw well until sidelined by a wrist injury. Three Rivers wasn’t quite the aggregation that was terrorized South Texas grid circles in recent years. But the Bulldogs were no pushovers, had licked Kenedy, 18-9 in their lone outing before meeting the Eagles. 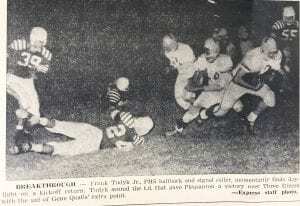 Article originally ran in the September 26, 1957 edition of the Pleasanton Express.